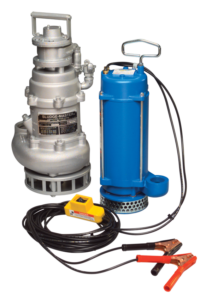 Sandpiper offers several options for submersible pumps. Watch the video to learn more. The PortaPump® Submersible, Battery-Powered Pump operates using any 12-volt car or truck battery. It comes equipped with cables and battery clips. Extremely portable, the pump weighs only 33 pounds (15kg) and can fit through openings as small as 10″ (25cm). Electrically safe and whisper quiet. The SludgeMaster™ Submersible, Air-Powered Trash Pump handles mud, leaves, twigs, sand, sludge, trash-laden water and soft solids to 1½” (3.8cm). High capacity, low head. The pump weighs only 59 pounds (26kg), and can fit through an opening as small as 14″ (35cm). Sturdy construction for rough handling and long life. Optional rock screen available.